Yep camera is a bit crap but 4.4 is already out in the US and it'll be here within weeks, maybe days. In th mean time there are some decent 4.4 launchers in the Play store. I sold my Nexus 5 to CEX for £280, got a moto g for £99 and kept the change. I've not noticed a huge change bar refinements and weight, and when the moto g gets 4.4 it'll be even more slick due to the lower memory requirements. What's the battery life like on a Moto G? I've been procrastinating over getting an Android smartphone for months. I want something with a battery life good enough to to run a Bluetooth connection to a standalone GPS receiver all day. Ideally, tough enough to withstand some knocks, damp and maybe rain & wind. I like the sound of the ruggidised S4 and the Z1, but I'd be paying a lot for other capabilities that I'd barely use. @Bremenacht up to two days average use (web, music, calls, etc). Usually at 50-60 after 16 hours anyway. Best I've had pretty much, all others - especially the Nexus 4 and iPhones - tend to be in the lower 10-20% by then. With inbuilt GPS it doesn't fare so well mind, but what does? I'd guess it's pretty tough too and should take a fair few bumps without going all iPhone and cracking up. Z1 Compact out within the month. Wahey. You want battery life? Try the LG G2, 30 hours on normal usage. 'Need' a phone with expandable storage, unfortunately. Ah then Sony Z1 I guess. Isn't 32gb enough? I have just replaced my Desire with an S3 Mini (quite cheap on that link at the moment). It's pretty cool. Very light and a little smaller than the Desire. Have been using a Nexus 7 for browsing as I had the same battery death issues that most seem to get (mine couldn't even charge after a while). S3 Mini seems to have a lot of the nice functionality of a tablet in a very compact size. Liking it a lot so far, but still getting the hang of it. The Z1 Compact comes with 16gb internally and I've got a 64gb card already in my current phone. Tbh you're right, 32gb probably would be enough. But the price isn't outrageous and I think I'll treat myself to a shiny new toy. Well the reason I asked was that I was going to go with a Z1 but I was then swayed by how cheap and lovely the LG G2 32gb was off contract. Chances of both the new HTC One and the S5 being released by around April/May? Decided against the Z1 Compact after my initial excitement, think I've decided to just get my current phone repaired and then wait a few months to see the new flagships. Z1 Compact ticks all the boxes apart from screen size, I'd like a bigger screen than my current 4.3" HTC, but not something as cumbersome as the Z1 itself. Any reason not to buy through them? They don't do Three, their cashback process is slightly rubbish (had one of the claims not go through, having to post this months as they seem to think I've already claimed). They also put extras on you have to manually cancel. Apart from that pretty good, think they're a subsidiary of carphone warehouse. Cheers. The deal I'm looking at depends on cashback to make it worthwhile, so interesting to read that. Not concerned about the other stuff. Myself and the wifey had our last phones with them (2yr contracts, almost up now) and it all went without a hitch. Delivery was on time, and we cancelled their insurance add on thing through the necessary website no problems. Wifey has been doing the cashback claim procedure as and when she needs to, and has never failed to have the cheque sent to her. Just get an iphone 5s. Don't be nerds. It works. @captainrentboy Ta. Cashback routine seems a bit of a hoo-haa, but I'll just have to stick some reminders on a calendar or something. Little later than I expected but I finally got round to buying a new phone, opted for the 32GB LG G2 in the end. Does anyone have any recommendations for a good case to protect it? Sorry for the long post but just looking for some thoughts if anyone has any insight they'd like to share! I've currently got a Samsung Galaxy S2, choice between SIM only and upgrade is due in the next couple of weeks. I don't like the big screen phones but would still want something with some power behind it, so a choice between iPhone 5S and Sony Z1 Compact looking at the current crop available. Or seeing as I'm still content with my S2 and I've never been big into phones and having to have the latest models, I could just stick with that for now and save some money and hassle. Z1 Compact would cost less and be less of a hassle to transfer stuff given it's Android to Android, plus it looks more durable with its waterproofing etc. and like it may possibly have longer battery life. I'm fine with Android and I like having the freedom it provides. Interested in any possible links with other Sony devices too, notably PS4. However I do prefer the design of the 5S and I am interested in trying out iOS despite it meaning having to buy into the whole Apple thing. Anyone got either of those phones and any comment to make on them? Would I really notice a big difference going from the S2 to either of them? Speed wise (With regards to nipping in and out of apps and generally getting around the menus and stuff) there will be a fairly noticeable jump in performance with either of those phones. General screen and picture quality (Resolution, colour reproduction) will also be better. You'll also be able to play more demanding apps. I went from a One X (which is newer than the S2) to Sony's latest offering, and I've found it to be a worthwhile upgrade. With regards to the Z1 mini or 5S, that'll be down to personal preference. I don't think the Z1 mini has the same build quality as it's bigger brothers, but it has had fantastic reviews. As I don't particularly like ios, especially after using Android for so long, I'd stick with Sony. @LionheartDJH I've had a Z1 since it came out and it's a lovely phone. Very quick, excellent display and outstanding Sony build quality. I use mine mainly for work, but do use it for Bluetooth connectivity, navigation (sat nav), music, email, texts, Dropbox etc. The camera is very high quality and takes superb pictures. I'm not sure what version of Android your S2 has but my Z1 is on 4.4 (kitkat IIRC) so if you're currently using 2.x you will notice a big increase in the Android OS experience. The upgrade path will be very easy S2 - Z1 as all your apps can auto download to your new device along with Gmail & contacts. I don't do Apple products but be prepared to re-learn how to use your smartphone all over again as although Android and iOS are similar they do work differently to the user. Not unlike a windows PC and an iMac. @LionheartDJH I know this sounds odd, but the S3 might be worth a look, not a massive increase in screen size over the S2, but big jump in speed, functionality etc - I've had one and a good phone, camera etc and as it's 2 year old technology should be reasonably priced. BTW my other half is looking at the HTC Mate (8?) Mini 2, she doesn't like big screens, looks like a great phone, worth a look as well. Thanks for your comments guys, very helpful! 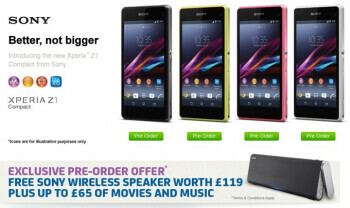 Think I'll plump for the Z1 Compact, makes the most sense. After over 6 years as an iPhone owner, I finally too th plunge and went for a change with the Xperia Z2. Absolutely love it, it's a beast.